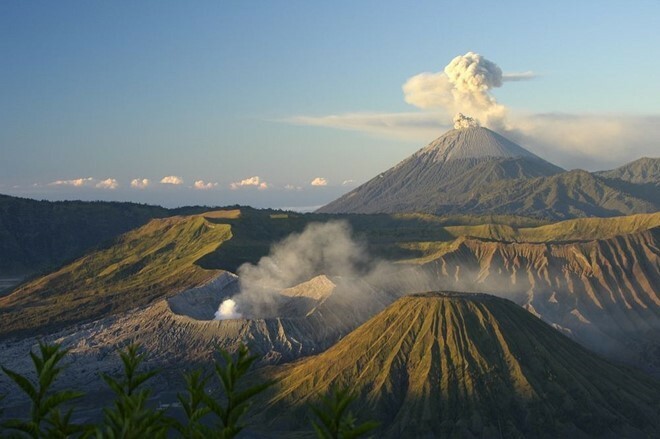 Bromo volcano located in the western Java island – Indonesia is the strongest active crater in the area where is well-known for its height of 2300m. 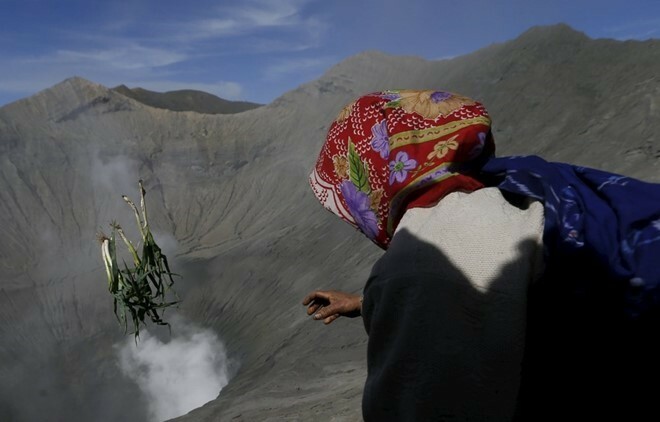 Bromo mountain lying in the middle of a full desert called “Sand Ocean” were so called a home for nearly 90.000 Tengger group. 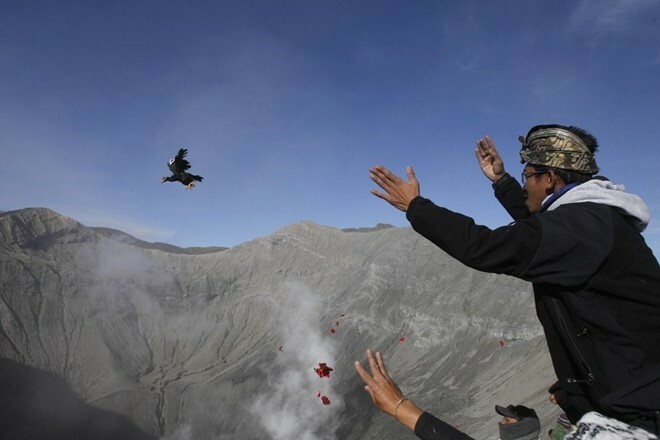 Whenever it is going to erupt, the people fulfill a food sacrifice ceremony for the active crater. 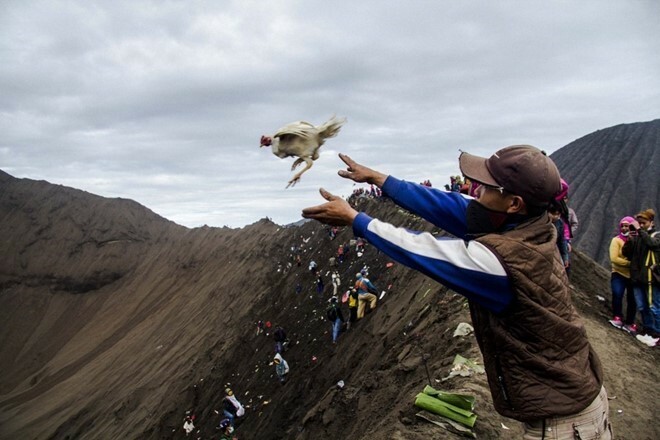 They throw many kinds of food into its crater such as fruit, rice, vegetable, chicken, goat, even cow, etc. 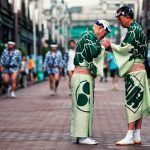 This ritual called Yadnya Kasada which celebrates for a month. Yadnya Kasada Ceremony is organized at a Pura Luhur Poten – a Hindu church standing among a desert. On 14th day of the ceremony, people come to pray at Pura Luhur Poten temple to get blessed by two genies named Sang Hyan Widi Wasa and Mahameru respectively. At the end of the ritual, they throw all the food into the crater. This ritual is celebrated at Pura Luhur Poten at the center of a desert. 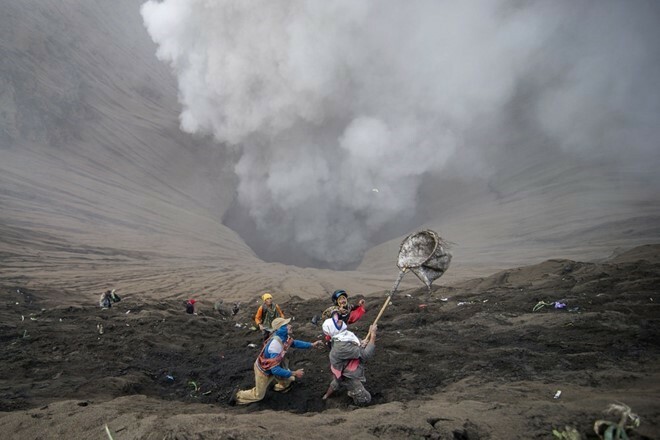 Although it is dangerous for ones who are standing nearly active crater, there are some people try to climb into its hole to take those things thrown inside with hope of getting back the luckiness. Some people use the net to take those things back. Tenggerian believed to be the descendant of Majapahit nation whose ruled Indonesia and some areas in the South of Asia from the century of 13th -15th before Islam’s invasion. 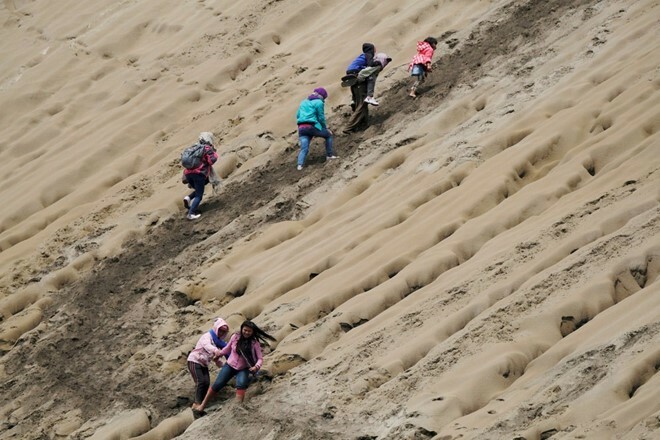 Due to its failure, people of this nation had run to Tengger desert till nowadays. There even a couple of Brawijaya King’s children to seek refuge. However, this couple hadn’t got children thus it made them extremely disappointed. 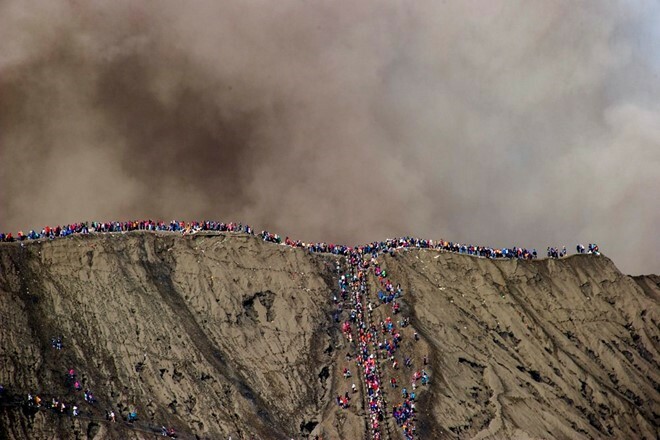 That is the reason why they climb to the top of Bromo. 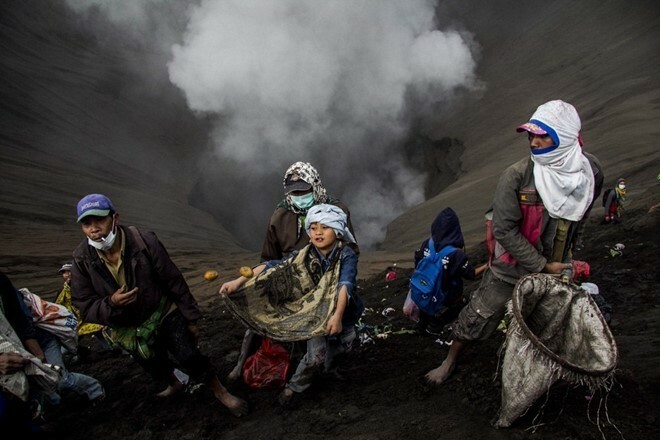 It is said that the genie of the crater has supported them to have giving birth again. Unfortunately, they had to sacrifice their first child in return. 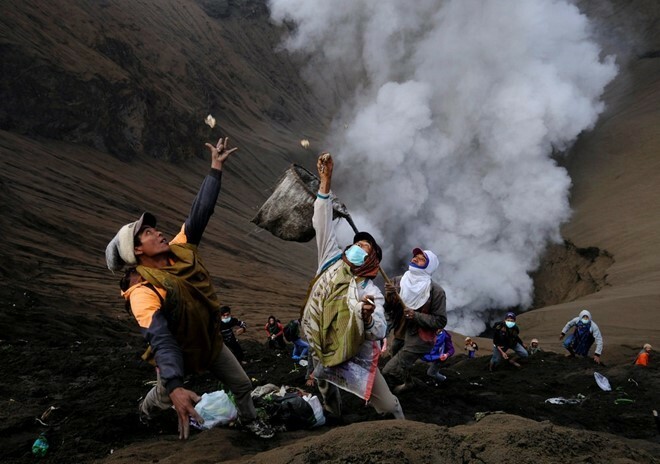 According to some other stories of this legend, this couple finally didn’t agree to sacrifice their child thus it lead to the genie’s fulmination which causes the eruption of the crater to chase the child’s life and to kill him. 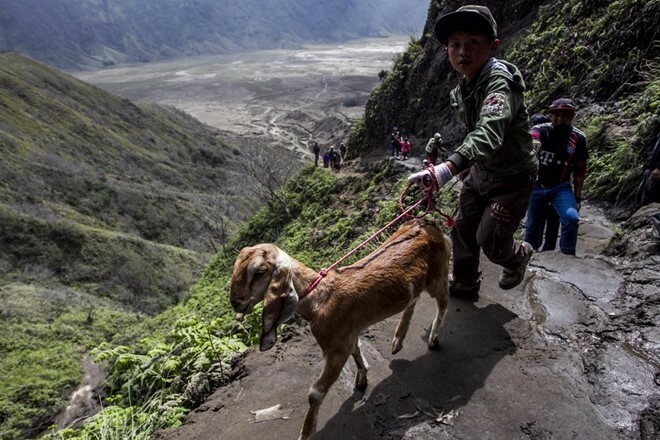 It is said that this area tradition sacrifice originates from this legend..
People take their animals to the mountain to sacrifice for the genie. Children additionally participate in this ritual.